Install high efficiency refrigeration equipment, such as zero energy doors and anti-sweat heater controls (rebates available). 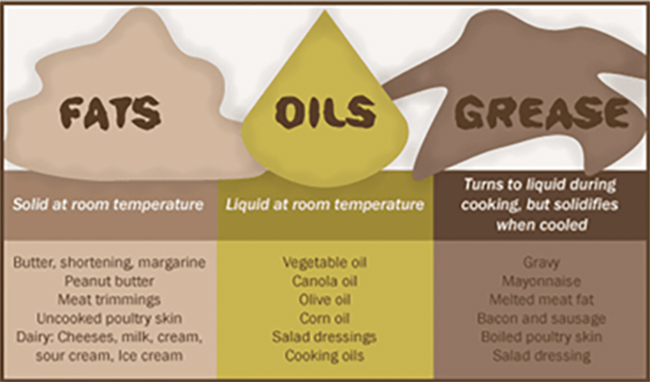 Over time, fats, oils and grease (FOG) can cause clogs in your home and in our wastewater (sanitary sewer) system. When FOG goes down a sink drain, it is not broken down by the garbage disposal. Rather, it cools in the wastewater system and sticks to the inside of the pipes, creating FOG buildup. This buildup can lead to sewer blockages that send untreated wastewater backwards – out of manholes or back into your house or your neighbor's house. You can help prevent FOG from causing backups and harming our sewer system by disposing of your used food waste responsibly. Remember, FOG clogs. Pour cooled FOG into a sealable container and put it in the trash or take it to an oil recycling center. Before you wash your dishes, scrape FOG food scraps into the trash or compost, if appropriate. Soak up remaining FOG with paper towels and put them in the garbage. Soap and hot water do not wash away FOG. Soap and hot water do not dissolve FOG, they only move it further down your pipes, where it will eventually cool and harden, and can still clog sewer lines and create backups. Garbage disposals don’t make FOG disappear. Garbage disposals grind up the greasy, fatty foods into smaller particles, which will still cling to pipes. FOG shouldn’t go down the toilet either. Wastewater from every sink, toilet, shower/bathtub, dishwasher and drain in your home is connected to a single sewer pipe from your residence. All wastewater ends up in the same sewer pipe. Cooking oil alert. 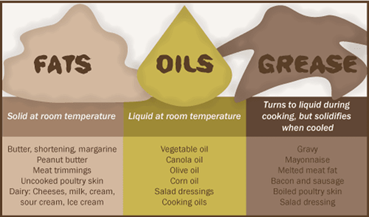 Some cooking oils, like vegetable, canola and olive, don’t solidify. Instead, they congeal, coat the pipes, and collect other particles and solids, which can lead to a backup. Learn more about sewer blockages and backups, email d2FzdGV3YXRlci1zZXdlckBmY2dvdi5jb20= or call 970-221-6233. To report a blockage or backup, call 970-221-6700. You may also want to notify a plumber to begin the clean up.